The Chinese walnut cookie (he.tao.su / hap.to.so) is my favourite traditional Chinese cookie. This Chinese New Year I am in search of the perfect recipe. When I was doing research, I realized that this might be the most popular cookie in all of China. According to a story I read, it originated in Jingdezhen, in the Jiangxi province, the ceramics capital of China since the ancient times. It is believed to be started by a ceramics craftsman who brought dough from home to bake by the kiln for food because the working hours were so long. He then added walnuts to calm his cough condition. But eventually walnuts were eliminated in the recipe because of its bitterness. Another story says that the character tao in tao.su means ceramics, not walnuts. The version that I am used to actually contains little or no walnuts at all. Regardless of the story, it eventually spread all over China, winning the hearts of cookie lovers. The traditional recipe uses lard, which makes it so wonderfully crumbly and flavourful. However lard is not a popular baking ingredient in North America, and I find that the lard sold at supermarkets is very bland. Unless you made your own lard, it doesn’t lend much flavour to the cookie. Butter, on the other hand makes a good subsitute but it has moisture so it would effect its texture. To get the best flavour and texture out of butter, I tried browning it. 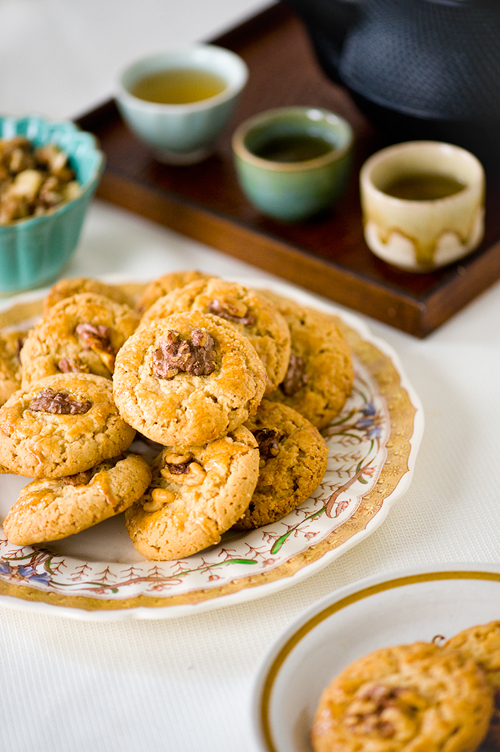 My version: browned butter Chinese walnut cookies – deliciously crumbly, sandy, and packed with nutty flavour. to make browned butter, melt 170 g / 3/4 cup unsalted butter in a small saucepan on medium heat, swirling pan occasionally until colour turns light brown (you might need to skim off foam to see colour). Strain with a fine mesh strainer into a heatproof container, cool until ready to use. Preheat oven to 325 F / 160 C. Set the oven rack to the top third. Line two baking sheets with parchment. Mix the egg and form a dough. It might be a bit sticky at the beginning, but it will eventually form into a soft dough. 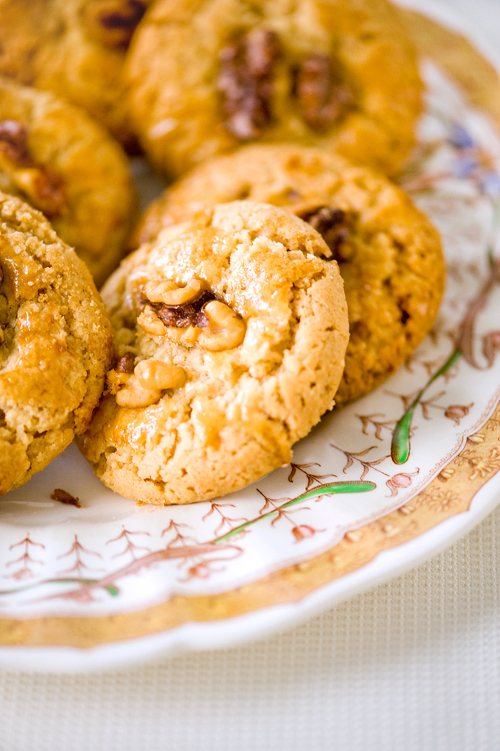 Avoid over-mixing or kneading it otherwise the cookies doesn't spread nicely during baking. A note on baker’s ammonia: I tried to stay true to the classic texture and look of the cookie by using baking ammonia or baker’s ammonia, which is a precursor to leavening agents baking soda and baking powder. It is usually found in very old recipes. It reacts to moisture and heat, and it is suitable for a longer leavening process. I managed to find some at a specialty store (there are sources online too), but you can substitute it for the same amount of baking powder but it might change the texture and its cracking appearance. If you do use it, be aware that baking ammonia smells VERY pungent, but it will dissipate as the leavening reaction is finished during baking. I suggest storing it in an airtight jar and keeping it in a cool and dry place. FUN FACT: If you have ever had a Cantonese style steamed BBQ pork bun, you would notice its signature bursting exterior, which is a reaction from using baking ammonia. I think this might be the perfect twist to this traditional treat – the texture and appearance echo its original version with the addition of a more nutty and complex butter flavour. I remember that they were much bigger when I bought them as a child, about the size of my small face. Though not a complicated recipe, I am so proud that I was able to recreate its texture because it is so nostalgic. These make a great companion with a cup of robust Chinese tea – my favourite is a good, smooth pu’er. 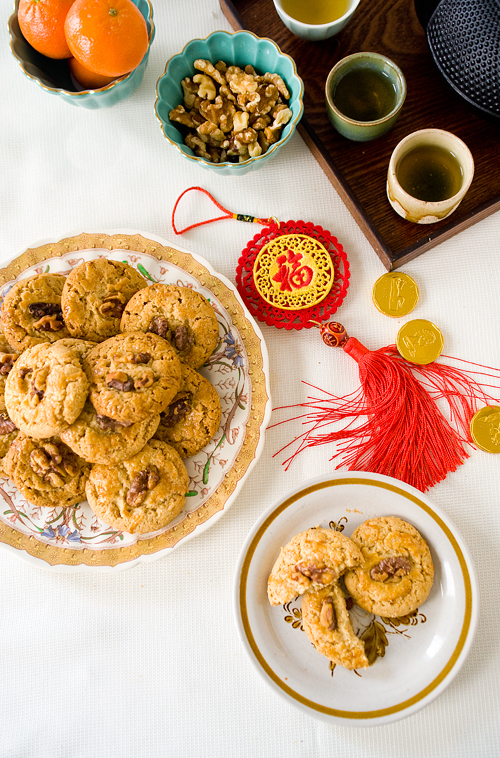 Thanks to Christine from Vermilion Roots for spearheading the Chinese New Year Cookie Party, this recipe is my contribution to celebrate this holiday with bloggers from all over the world. Hop on over and check out my fellow bloggers’ yummy cookie creations! Join us on social media with the hashtag #ChineseNewYearCookieParty with your cookie photos! Whether you celebrate Chinese new year or not, cookies is always a good idea. In the year of the monkey, I wish you and your family healthy and prosperity! What gorgeous cookies. I’ve never tried walnut in cookies before. As you mention, these nuts do lend a bitter aftertaste. How do they fair in cookies? I personally don’t mind the mild bitterness in walnuts, especially if they just top the cookies. I’ve seen versions of the cookie topped with sliced almonds instead, or just left plain. I think pecans would also make an excellent replacement! I was so excited when I baked the cookies too, so good!